The Anglo-Irish composer Sir Charles Villiers Stanford (1852-1924) was born in Dublin and transcended his Irish roots to become Professor of Composition at the British Royal College of Music at the young age of 31. 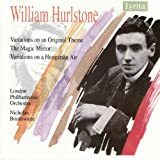 He has been traditionally regarded as a great teacher whose pupils included Vaughn Williams and Holst and until recent years was remembered mostly for his eccliastical choral music. 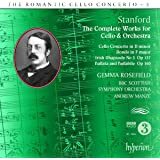 Stanford, however, also wrote some seven symphonies, six Irish rhapsodies, a clarinet concerto, and two operas. 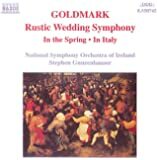 The Third Symphony recorded on this CD dates from 1887 and is perhaps his most successful symphonic work. Stanford's Third Symphony relies on a bewildering array of Irish folk melodies for its thematic content. Many other well-known composers from the same period, including Max Bruch, Nicolai Rimsky-Korsakov, and the somewhat earlier Edouard Lalo, also drew heavily from folk music. Even the much earlier Joseph Haydn made good use of folk melodies in a number of his symphonies. What is really striking about Stanford's Third Symphony is the very imaginative and original use of folk music. Although he does an effective job of varying and "morphing" melodies to lead into one another, he shows remarkable ability to vary orchestration so that the same melody can appear several times but sound different enough each time that the music never becomes tedious or otherwise drawn out. The music varies from sublime beauty (third movement - andante con moto) to a rollicking wild ride (the finale of the fourth movement). The Ulster Orchestra under the direction of Vernon Handley gives an excellent performance of this work - well paced, delicate where needed and full of galloping energy in other spots. The recorded sound is bright, clear and precise. 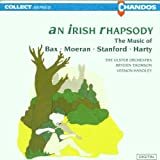 The Fifth Irish Rhapsody was composed by Stanford in 1917. It was meant as a tribute to the Irish Guards which, like so many miltary units on both sides of the First World War, fought with grim determination while suffering horrendous losses. 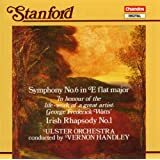 This rhapsody was Stanford's way of paying tribute to his fellow Irishmen who fought for his adopted country. Like his other Irish rhapsodies, the music is based on Irish folk melodies and it is a lively and enjoyable work. Normally this reviewer would not give a five-star rating to a symphony based entirely on themes developed by someone other than the composer. An exception will be made in this case because the choice of melodies is well thought out and the manner with which they are varied and intertwined with one another is exceptional. Stanford's Third Symphony may not be musically deep, but it is absolutely delightful. And be prepared to sit tight in the saddle for the livelier parts. Liked the music very much. I have never been able to get into Stanford's symphonies very much. All seven of them are melodic and pleasant in their way, but they have always struck me as somewhat aimless. If there is one that I can listen to without it becoming background music, though, it's the Third Symphony. 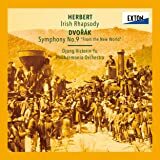 It is a bit of a mélange, I grant, but it's a tuneful hodgepodge that draws upon Irish themes and presents them in a lush orchestral setting. 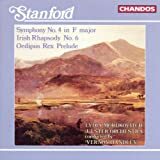 Meanwhile, Standford's Irish Rhapsodies -- there are six of those -- always appealed to me more than the symphonies. Perhaps because they are shorter, they have a directness that the symphonies often seem to lack, at least to my ears. 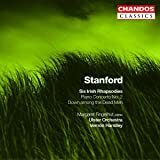 Of all the Rhapsodies, the stirring Fifth is my favorite, and so the nice thing for me about this disc is that it contains the one Stanford symphony that I like and my favorite of his Rhapsodies. Both works are played with excellence by the Ulster Orchestra under Vernon Handley. 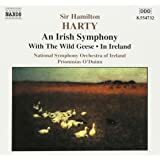 For some lush music that evokes a romantic sense of the Emerald Isle, this disc can stand alongside your favorite version of Hamilton Hardy's Irish Symphony.